Become a Premium Member and post notes and photos about your poem like Connie Marcum Wong. LOVE IT! My favorite bird even though we don’t have them in California. Love them in red or yellow. Just a beautiful bird and you summed it up here most gracefully. Congratulations on this! Hi Connie, your wonderful fluttering of wings has very deservedly flown to you with a win! Congratulations. Love this Haiku! Poetry hugs, Jennifer. Well deserved win for this perfect haiku Connie, congratulations. Tom. Beautiful, Connie. I love seeing cardinals among the pine branches, their color is such a bright spot. Congratulations! 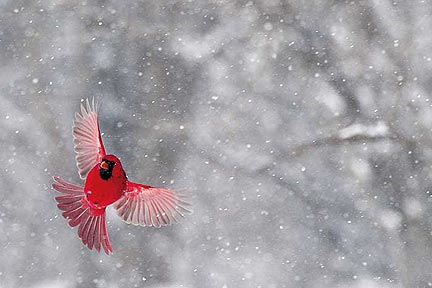 Gorgeous imagery, love cardinals, congratulations on your win! I really like the way you made the SOUNDS in this one, Connie. Congrats for your win. Lovely image Connie. Good luck. Tom. I love this little tribute to the cardinal! I have a mamma and pappa in my back yard most mornings. gorgeous imagery and picture you showed us too. I did a summery haiku. Did it need to be winter?? I better check and see. No Andrea, just about nature. Tom. Connie, vividly enchanting haiku. Perfect! You captured that imagery brilliantly in your poem, Connie.